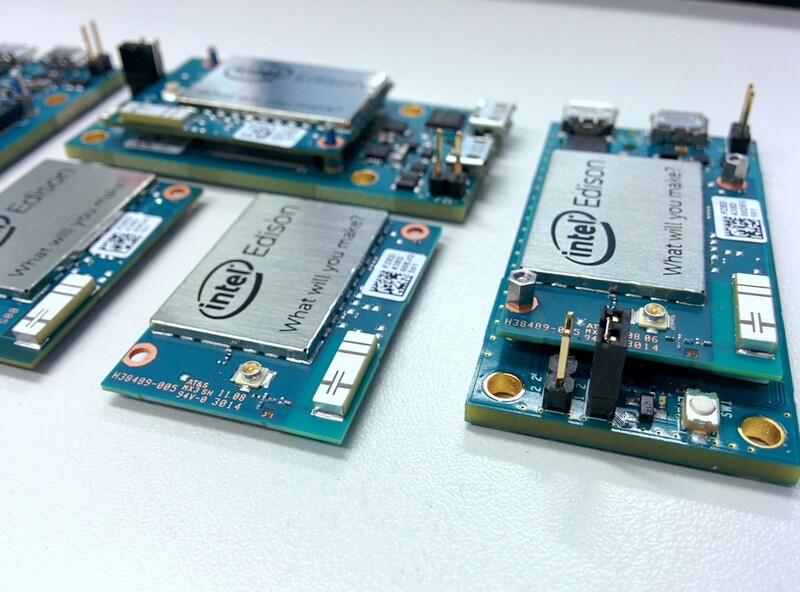 After having worked a lot with RPIs, Beaglebones and other credit card sized computers, I have to say I am still amazed about the new Intel Edison. It combines 500 MHz processing power with WiFi and BLE connectivity in the size of a bigger stamp. The form factor feels right even for many wearable use cases. I can see a lot of custom PCBs comming up in the next month that will use the edison as core for wearable and IoT applications. But even when attached to the breakout board, the overall size (61 x 27,5 x 8mm) is still attractive for a lot of (wearable) use cases. However, the biggest drawback that I can see right now is its high energy consumption of 200-500mA. I haven’t looked into its sleep mode strategies yet, but I believe interesting low-energy configurations can be created by using the main CPU and its concomitant smaller MCU. I decided to share this tutorial because it wasn’t as straight forward to setup the Edison as I thought in the beginning. What we will do in the next five minutes is connecting the edison to a windows 7 computer, checking its version, updating it, connecting to WiFi and installing some usefull packages. Assemble the Edison and the breakout board and connect two micro-USB cables to your computer. The middle one (labeled J16) is for power and exposes the Edison as USB drive, and the upper USB port (J3) is for exposing a serial console as virtual COM port. 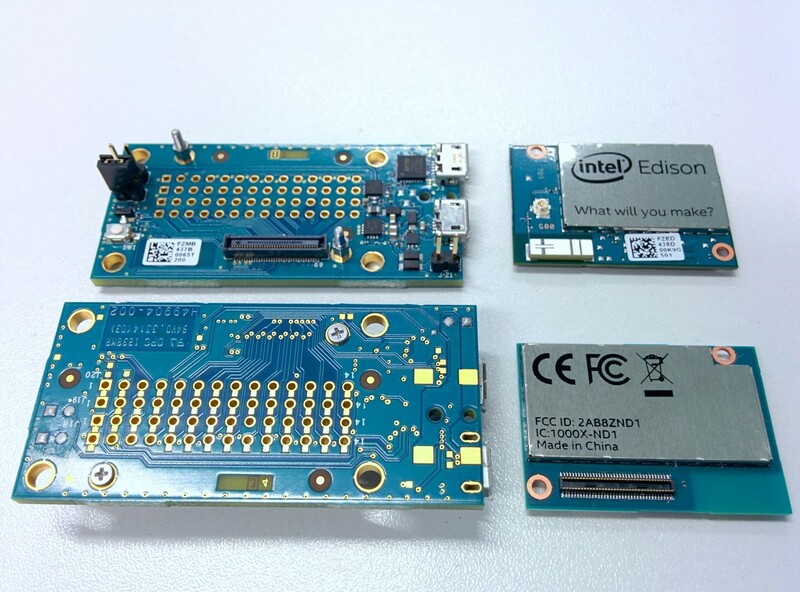 Download and install the Intel Edison driver package – you should now have a new COM port in your device manager and an empty new “Edison”-drive in your file explorer. We will need this later for updating its operating system. Since this is a pretty old version lets update the Edison before we start configuring it. Download the most recent “Edison Yocto complete image” and unzip it somewhere. Before we copy the files onto the “Edison” disk in your file explorer, we need to ensure that the drive is “FAT32” formated. On my device it was initially only “FAT” formated and the Edison couldn’t correctly read the files during the update process. Format the “Edison” disk with “FAT32” using the right mouse button context menu of your file explorer. Afterwards copy all the files within the unzipped folder onto the Edison drive. Well done! You run an up-to-date Edison now. Let’s do the initial configuration and connect it to WiFi! Choose one of the WiFi SSIDs shown in the list and enter its password. You’r done! Go to “http://your_edison.local” and see a status page! You should also have SSH access via WiFi by now. Start up putty and give it a try! Now update the packaging index and try to install a package (e.g. another text editor such as nano, or git ). Close and save the file (in vi type : ESC :wq). You might want to edit “/etc/default/ntpdate” to make the Edison update your time regularily. All done! Congratulations, you have a fresh Edison, connected to the internet and with access to a package system. Happy coding and feel free to leave a message if you find think I missed something!